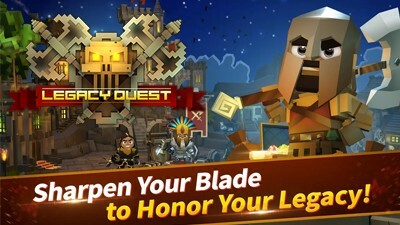 Here's a list of tips and guide for the Android and iOS mobile game Legacy Quest. 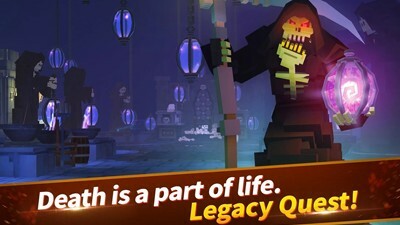 Legacy Quest is a dungeon crawling hack and slash mobile action RPG game with a nice touch of 3D retro pixel style, presented by NEXON Company. Learn quick, sharpen your blade and slash your way through over 70 unique dungeons in 6 vast regions to restore your family Legacy to it's former glory! - You need torches to enter a dungeon, similar to Stamina from other games. - 1 Torch for Normal Dungeons, and 3 Torches for Mini Bosses or Final Boss Dungeons. - You can light up extinguished torches with Skulls (optional) or wait for it to automatically replenish overtime. Some limited events will also reward some torches. - Gold is an important resource found in dungeons by defeating enemies, hitting breakable objects, or by opening chests. You can also earn Gold by selling items in the Stash of the Castle. - Used for upgrading castle buildings, for Crafting to improve your heroes' gears. - To Unlock or Upgrade Skills, and used for recruiting new heroes. - Skulls are the premium currency of Legacy Quest. - Get them as quest rewards from clearing dungeons, open reward chests, or buy them directly from the Shop (optional). - Skulls are used to replenish torches, expand inventory for more space (highly recommended), or to purchase premium items from the shop. - Slay monsters to get Souls and use them to level up your Heroes. Souls can only be gained by fighting monsters in the dungeons. - Souls are used to strengthen your Family permanently and unlock mighty Talents at the Talent Tree. - Optional: Used to revive fallen heroes. - Login everyday to claim various free items from the "Daily Rewards of the Week" Event. - Check your in-game Mail as well for more freebies from the Legacy Quest team. - Most important stat in the game because it is needed to unlock most in-game features, like new buildings and dungeon difficulties. - Complete Story-line quests (check Quest Log) and achievements to claim Legacy Points as rewards to level up your Legacy Level. - Increasing your Legacy Lvl will allow you to increase the number of torches you can hold, giving you more gameplay time when using Torch Refills given into your in-game Mail. To help you hunt monsters related achievements, refer to this guide: List of Monsters and Locations. - Advance your main story line quests to get rewards like Legacy Points. - Complete all Daily Quests to obtain free Skulls as completion reward. - Achievements are your long term quests for more Legacy Points. - To help you find certain monsters needed to complete some "monster hunting" related achievements, refer to this guide: Monster List and Locations. How to Check Stats From Items? - To view your item's stats bonuses, or to check the description of an item, just hit the [i] info icon. - Really helps to navigate around the dungeon. Follow the "Yellow Arrow" around your hero to get back on the recommended route. - This is a very handy escape mechanism. Use it to escape enemy mobs coming at you, dodge powerful attacks or nasty traps, to place your hero into a nice position for strategic attacks, or to move faster around the dungeon. - Mind it's cooldown though, and avoid landing on traps, sticky webs, and other nasty monster tricks. - HP Potions can't be purchased with Gold in this game, either buy them from the SHOP using Skulls or farm them from certain dungeons that drops them by chance (also drops from breakable objects). - You can only save up to 10 pieces of HP Potions. - Reserve them for important battles, or to save your precious hero from certain death. - Although it's fun to spam skills, don't forget to save enough Mana for the final boss of the stage. - Some monsters drop mana globes, pick them up to replenish some mana. - Clearing dungeons with better Stars will yield greater rewards. Max Multiplier = Done by eliminating a series of monsters while keeping the "Multiplier Bar" active. Use dodge rolls to move fast between enemy mobs, and try to stay near the entrance of the next area to reach it faster. Monsters Killed = Kill as many monsters as you can. Time = Move fast, use dodge rolls, use you skills wisely, and kill fast. Dungeon Score = The total number of points that you have acquired through various activities. - As much as possible, never let your Hero get killed because the consequences aren't cheap. - Once a hero falls in battle, you are given a last chance to revive him or her with Souls or Scroll of Resurrection. Note that every time you revive a hero, the Cost will increase so you should really think wisely which hero you should really save. - He or she will be reborn in the middle of the a battle. - If you think that you can clear the dungeon, then go on and revive your hero, but if you think that you cannot win that same battle, it might be best to give up instead, your choice still though. - The hero will be history, and you will be returned to your castle. Fallen Heroes will also take a huge EXP from it's Lvl, giving only about half of it's Lvl to your new hero. - Every time your hero falls, you can recruit a new Hero of the same class as your previous one at your Castle, free of charge. - Re-rolling changes Hero's appearance and traits. You may also get a higher level hero if you are lucky by re-rolling. - If you don't like the new Hero, you can always re-roll another one with Gold. Once you select a Hero, you cannot roll another Hero until it dies. - Chests are found when you defeat mini-bosses or final boss monsters, which generates a variety of rewards. Note: You can only hold up to 10 pieces for each kind of Chests, if you reached the max capacity, it is sometimes best to sell at least 1 chest in-case you'll get another one from your dungeon runs. - Chests can be unlocked with keys at the same or higher grades as the chests. - Keys can be farmed from the dungeons (chance drop) or purchased from the SHOP. - Recommendation: Always save at least 2 keys per day for your Daily Missions. - Your Inventory is shared by all of your Heroes, so equip gears that can be equipped to free up some space. - All items and materials except gears can be stacked up to 99 pieces, and other items up to 10 pieces. 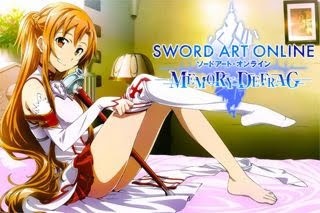 - When your inventory is full while in dungeon, you can sell or discard unnecessary items and earn extra Gold. - The inventory has 24 slots by default, if you want to expand it, you need to spend 25 Skulls per expansion. This highly recommended, save your Skulls for this one and expand as you get more items. - A place where you can unlock and upgrade powerful skills. - To unlock or upgrade an Active, Passive or Ultimate Skill, you need to hunt for it's identical Skill Book from the dungeons first. You can also get Skill Books by from Shop, or through event rewards. - Unlocked Skills are available to all your heroes, regardless of their job class. - Upgrading a skill reduces its cooldown and adds greater power. - A hero can equip a maximum of 2 Passive skills, 2 Active skills and 1 Ultimate skill. - Always active and will automatically take effect under certain conditions, doesn't need MP. - To use an Active skill you will need to have enough Mana. - Kill monsters to charge your hero's ultimate skill. Save and use for boss fights. - When you leave a dungeon wing, your meter will reset. - Only unlock Skill Books if you think your hero will use them, keep the others from your inventory for later use or for the other heroes. This will help your save Gold for other upgrades early game. - Fire Trap is an early game active skill that is very useful for all classes, nice DPS that can burn multiple enemies, great for clearing weak enemy hordes. - Stomp is also available early game, this will serve as your crowd control active skill. - Use Souls from slain monsters to foster your family's might! Yes!, now you can make your heroes stronger and stronger through time, despite the circle of life and death hehe. Not only that, The Skill Tree does not affect only one hero, it affects your whole hero clan! - Strength: Increases the might of your Sword and gives Health bonus stats. - Dexterity: Increases damages of your Bow and gives Critical Chance bonus stats. - Intellect: Increases the impact of your Magic Wand and gives Mana bonus stats. - Each of the 3 available talent paths unlocks a set of mighty talents and increases attributes permanently. - Once you are able to fill up an attribute's gauge, you will get the chance to choose a certain talent. - Master a path, and you will unlock a powerful bonus ability! - Craft a wide range of mighty items to take on the forces of evil. - The better the level of used Cubelet materials, the better the item gear will be. - Leather, Cloth, Metal, Wood and Stone Cubelets. - To know which of these you need, you should visit the Weaponsmith, Armorsmith or Jeweller and take a look at the recipes, tap on the Cubelets to learn where to hunt them. - Enter the dungeon specified then defeat monsters and break all breakable objects to get them. - Cubelets exist in 7 different Tiers. They can easily be distinguished by checking the amount of Dots they have. - Using higher Tiers of Cubelets will allow you to craft stronger equipment. - Higher Tier Cubelets can be obtained by completing dungeons on a higher difficulty, or by converting 10 of the same Cubelets into the next Cubelet level. - "Great Success" is a random bonus when crafting items, creating an Uncommon, Rare, or even a Legendary item! - Chances can be increase by mastering the Lvl 7 Craftsmanship under Path of Mastery in the Talent Tree. - Crafting a better weapon and an off-hand gear asap can really help your journey early game. Once you have a complete set of gears, start earning your Cubelets then convert them to higher tiers. - Unlocks at Legacy Lvl 5. - Use orbs or gems to enhance weapons, armor, and jewelry. - Enhances your gears' stats when equipped. It's permanent though so it's is better to save your gems for better gears at mid levels, because during early game, leveling up is easy and fast, and you'll get lots of better gears as you go. - You can get more Gems by opening mystery boxes, earned from various in-game bonus rewards, or by purchasing them from the Shop. - You can only equip Gems on items that possesses Gem socket/s. - You can replace an existing Gem by another Gem if all slots are full. Replaced Gem will be destroyed so be careful. - Used for enhancing gears. Use Orbs that matches your gear's Grade to upgrade it. - Uncommon Orb: Enhances Common gears by 1 grade. - Rare Orb: Enhances Common or Uncommon gears by 1 grade. - Epic Orb: Enhances Rare or lower-grade gears by 1 grade. - Legendary Orb: Enhances Epic or lower-grade gears by 1 grade. - Orbs can be obtained by opening mystery boxes, earned from various in-game bonus rewards, or by purchasing them from the Shop. - Save your Gems and Orbs for better items at higher levels, or use them once you get stuck in the game, or if defeating monsters is getting difficult. - Always remember, most higher Lvl gears are better in terms of base stats (armor, health, primary stat or more) regardless of their grade (Common, Uncommon, Rare for example). This is very true especially early game, so better save your Gems and Orbs for high level items.